Do I really need another _______ (fill in the blank)? And before long you talk yourself out of buying it. Or you talk yourself into buying the item that you don’t like as much. When you focus only on what the mind says, it’s easy to end up with lots of stuff that you don’t actually use. While you may afford each individual item, can you afford to have a home full of things you don’t love? Do I genuinely love it? Will this item lift my spirits when I see it and use it? Will it enhance my life, my sense of self? Your heart knows when you’ve found a beautiful, quality item that you would not only use, but cherish. Your heart responds to beauty, quality, love and joy. And the more you listen to your heart, the more clearly it will speak to you. I am not arguing that you buy everything you love, but that, as much as possible, the things you do buy, be things you love. As you make decisions based on the wisdom of your heart, and not just the practical mind, you nourish yourself by inviting beauty into your life and home. I love your towels every single time I put my hands on them. And I think of the fact that you make them just because you want them to be beautiful. That means something to me and it makes a huge different to me. I love to touch them. I love to have them. I love to look at them. I love to wash them. I love to see them come out of the washer again. They bring me joy. 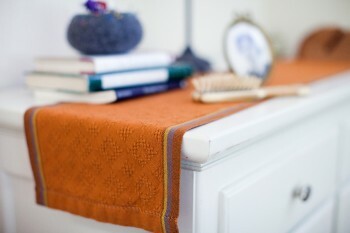 Take a moment and imagine yourself, your home, your kitchen with a beautiful handwoven towel. 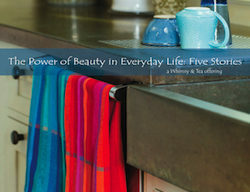 To treat yourself to a gift of everyday beauty, go here to pick the design that speaks to you.